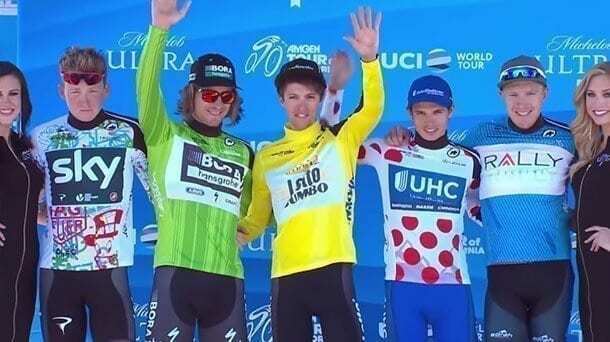 Team LottoNL-Jumbo’sGeorge Bennett (NZL) turned in an inspired Amgen Tour of California Time Trial ride in Big Bear Lake today to overtake the race lead, which he’s been chasing from second place since Stage 2 on Monday. He started the day six seconds behind race leader Rafal Majka (POL) of BORA-hansgrohe, and after today, not only overtook the lead but put 35 seconds between himself and the 2016 Olympic Games Road Race bronze medal winner, now in second. 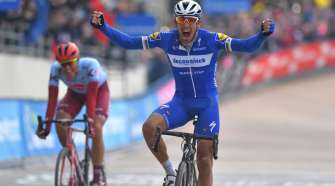 “No one expected this less than I did…After yesterday [losing four seconds on the race lead] I was so disappointed…I just started riding, pushing, pushing, pushing, and at altitude you can never really go over your limit; you can never go really deep, and I just held it…and then the next minute I’m wearing the yellow jersey,” said the new Amgen Race Leader Jersey wearer Bennett, who placed 7th in the last Amgen Tour of California and 6th in last year’s Vuelta a España Individual Time Trial. Cannondale-Drapac Pro Cycling Team’sAndrew Talansky (Napa, Calif.), who yesterday called the time trial the “race of truth,” performed well enough to crack the overall top-three, which had stood since Monday’s Stage 2 from Modesto to San Jose [Majka, Bennett, Boswell]. A stage win yesterday brought him to 4th place overall, having climbed closer to the race leader (+:44). The2015 U.S. National Time Trial Champion’s determined ride today propelled him to 3rd place, 36 seconds behind the new race leader, and just one second behind Majka. Team Sky’s Jonathan Dibben (GBR), who took 1st place in the Points race at the UCI Track World Championships last year, claimed the stage. At age 23, this is Dibben’s first WorldTour professional victory. Ian Boswell (Bend, Oregon), who was part of the 2016 Vuelta a España Team Time Trial stage winning team, dropped from 3rd to 5th place, one minute from the lead. 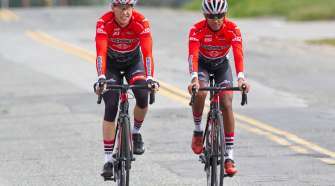 The 14.9-mile course for today’s Stage 6 presented by Lexus in Big Bear Lake was the race’s first time trial at elevation (6,700+ feet above sea level). 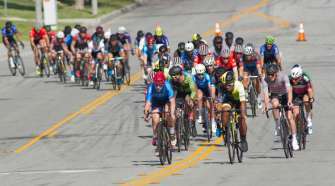 Fast, fairly flat, and technical with many corners, the course shook up the overall podium, which had been in tact since day two of racing on Monday. Team Dimension Data’s TAG Heuer Best Young Rider Jersey wearer Lachlan Morton (AUS), who came into the race in fifth place today (+:49) and ended it in ninth (+2:20), lost precious time with mechanical issues that caused him to trade out his bike twice on course. This also caused the coveted TAG Heuer Best Young Rider Jersey, which Morton has held since Stage 2, to transfer to Team Sky’s Tao Geoghegan Hart (GBR). Team LottoNL-Jumbo’s Robert Gesink (NED), the 2012 Amgen Tour of California champion, was also plagued by a mechanical, trading to a road bike mid-course and dropping from 8th place to 13th and falling more than two more minutes further from the race lead (+3:53). With the top-5 race leaders separated by a minute or less, tomorrow’s 77.7-mile Stage 7 presented by Breakaway from Cancer® from Mountain High to Pasadena will be a thrilling conclusion to the 2017 Amgen Tour of California. Overall race winners will be recognized in a special awards ceremony in downtown Pasadena just after the race ends.